The shocking nature of online abuse that Clementine Ford has received for her feminist writing is pretty widely known. In her first full-length book she fights back with a wholly justified vengeance. 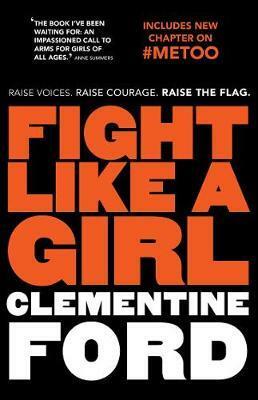 Ford describes this book as ‘an exploration of my experience as a girl in this world’ and it begins with her unwillingness as a teenager to identify with the feminist movement because she thought it was ‘irrelevant’ but really because she thought it might mean that boys wouldn’t like her. Ford goes on to describe her experience with an eating disorder, her sexual awakening and ongoing struggle with mental health. She positions all these experiences against a backdrop of the structural oppression (patriarchy, capitalism etc.) that shaped them. Importantly, Ford also acknowledges that she is a privileged white woman and that unpacking privilege is an incredibly difficult but important part of any movement. Ford’s writing is explosive, hilarious and incredibly accessible without dumbing down the big theoretical issues too much. In many ways this book is perfect for teenagers (I was going to write teenage girls but it’s essential that boys read this kind of stuff too) and I certainly wish this book had been around when I was a teenager. Reading it as an adult, I found that Ford has a wonderful ability to crystallise all that swirling unease that surfaces whenever I hear a sexist comment or joke but have become too complacent and lazy to call it out. Ford ends the book with a reassurance that ‘it’s OK to be angry’, which is good because now that I’ve finished reading it I am reminded that there is still so much to be angry about. Kara Nicholson works as a bookseller at Readings Carlton.